193 school levies and issues will appear on the November 6th ballots across the state. That was the conclusion of a study paid for by the Gates Foundation, into their own Teacher Evaluation/Merit Pay experiment or "The Intensive Partnerships for Effective Teaching initiative", which cost $575 million in total. Reformers should not underestimate the resistance that could arise if changes to teacher-evaluation systems have major negative consequences for staff employment. A near-exclusive focus on TE might be insufficient to dramatically improve student outcomes. Many other factors might need to be addressed, ranging from early childhood education, to students' social and emotional competencies, to the school learning environment, to family support. Dramatic improvement in outcomes, particularly for LIM students, will likely require attention to many of these factors as well. One of the recommendations should have been to listen to teachers. Over and over again, teachers warned that high stakes evaluations ties to student achievement would not only fail to produce the hoped for results, but would have serious negative consequences on students (over-testing) and teacher. Imagine if Gates would have spent his fortune on some of the items listed in the second bullet point, instead of listening to corporate education reformers and their desire to test and punish. A report in Gongwer details a newly introduced bill to address e-schools in light of the education catastrophe it has created for its students and school districts who have been deprived of hundreds of millions of dollars. Rep. Reineke said the legislation also would lead to increased transparency regarding e-school funding "because Ohioans have the right to know how these tax dollars are being spent." Rep. Faber said the bill achieves the goal by adding financial disclosure requirements regarding money spent on advertising, books, communications, promotions and travel, among other categories. He said the measure also would create a bipartisan committee to study the possibility of implementing a funding model for e-schools tied to student learning, rather than enrollment. The committee would be required to finalize its report by Nov. 1. This bill isn't designed to fix the e-school scam, it's designed to give political cover to the politicians like Kieth Faber and David Yost that engineered it either through policy or inaction. A toothless bill, with a reporting date a week before the general election is such an obvious political ploy it deserves its own transparency requirement. Chartered e-schools don't need fixing. They need to be closed down entirely. 91 school levies and issues will appear on the May 8th, 2018 ballot, roughly even split between renewals and requests for new money. With 122 levies and issues on the ballot, the total passage rate was a disappointing 71%. This is in large part due to the high number of requests for new money. The passage rates for renewals (93%) was in line with historical levels, as was requests for new monies (43%). Who Goes TEN Years NOT Giving Pay Rises to Professionals Helping the Developmentally Disabled? The Portage County Board of DD is Who. 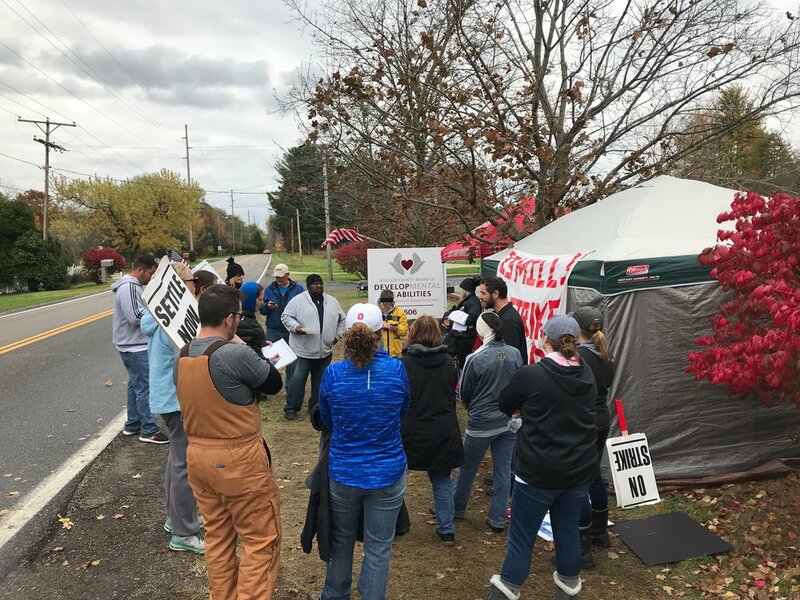 Why are such important people in the Portage county community on strike? They've been operating without a contract for over 14 months. Their board has refused to negotiate. Workloads have dramatically increased - they are currently serving over 700 individuals and families. Despite a $20 million surplus and this increased workload, these workers have not received a cost of living raise in TEN years! The board is unlike a typical school board, in that it is not elected. Instead it is appointed by the County Commissioners and a Probate Judge. We would encourage concerned citizens to contact board members and politely ask them to return to the negotiating table, and work out a fair and respectful contract. They are being ridiculous, and it's hurting their community. If you live in, or near Portage county, there is a vigil at “the rock” at Kent State on Monday November 6th at 5pm. We're certain these dedicated people would love the support.